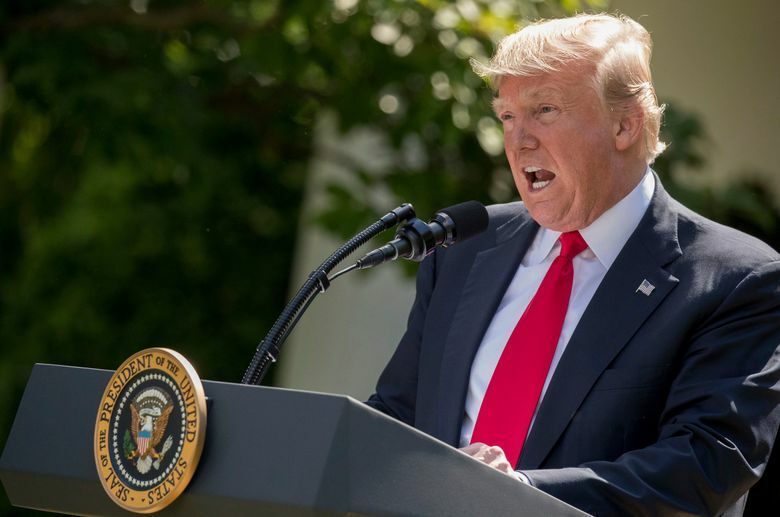 President Donald Trump’s decision to pull the United States out of the Paris climate accord — which kept a campaign promise — drew quick rebukes from prominent Washington state Democrats, as well as some Republicans and business leaders. President Donald Trump’s decision to pull the United States out of the Paris climate accord — which kept a campaign promise — drew quick rebukes from prominent Washington state Democrats, as well as some Republicans and business leaders, but was defended by the state’s top congressional Republican. Gov. Jay Inslee, in a media conference call with other Democratic governors, blasted the decision and said states like Washington will move to fill the climate leadership void. “For America, the country that defeated fascism and communism, to now have a president who has run up the white flag of defeat against this global threat of climate change is just pathetic,” he said. Inslee’s office also announced he’ll join New York Gov. Andrew Cuomo and California Gov. Jerry Brown in forming the United States Climate Alliance, a coalition of states devoted to upholding the Paris agreement and taking aggressive action on climate change. Inslee previously has committed the state to ambitious climate goals, though he has failed to win approval in the Legislature for major environmental programs, such as a cap-and-trade system limiting carbon emissions. Inslee has pressed ahead on a carbon limit, using his own executive authority. Rep. Cathy McMorris Rodgers, R-Spokane, the third ranking Republican in the U.S. House, defended Trump choice, criticizing the Paris deal which had been signed by former President Barack Obama. “We all want to protect our environment and ensure we leave a better community for the next generation. The problem with the Paris Agreement is how it was done—without the approval of the American people or their elected representatives through a ratified treaty. I agree with this decision and look forward to future conversations about how we can have a stronger environment and a stronger economy,” McMorris Rodgers said in a statement. “Withdrawing from the Paris Agreement is a crushing affront to Americans and a brutal blow to U.S. standing in the world,” said K.C. Golden, senior policy adviser for Climate Solutions. He said the nation’s efforts on climate had been “unconscionably weak and slow” even prior to the decision. Like some other major corporations, Microsoft had urged the White House to stick with the Paris deal, and CEO Satya Nadella took to Twitter after Trump’s announcement to express concern. The Redmond company had publicly supported the Paris framework since 2015. After Trump’s inauguration, the company urged the administration to remain committed to the accord, both in private correspondence and an open letter with other U.S. corporate giants, including Apple, Intel and Morgan Stanley, that was printed in major newspapers over the last few weeks. Facing 2 choices on Paris Climate deal, it speaks volumes that Trump chose a short-sighted political payoff over long-term responsibility. In a Facebook post Wednesday, Rep. Dave Reichert, R-Auburn, also criticized Trump’s intent to withdraw from the climate pact. “The Paris Accord gives the United States a global platform to be a leading voice on international issues impacting our economy, security, and the environment. Withdrawing from the agreement would cause us to lose this influence,” Reichert wrote. But Todd Myers, a staffer with the business-backed think tank Washington Policy Center, argued in a blog post the Paris accord was largely symbolic and said leaders should focus on technological innovations instead of political mandates. He cited his own use of an iPhone app to monitor his home energy use. “I have incentives to use this information to reduce my electrical use, saving money and reducing my carbon emissions. Unlike political agreements, politicians can’t withdraw from technology,” Myers wrote.